Finland’s Ministry of Transport and Communications set up a “Future motive powers in transport” task force in January 2012 define targets and plans for achieving them, for different transport sectors including road, rail, water and air transport in 2020 and 2050. 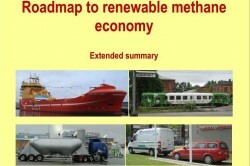 The report outlines a target of 40% use of renewable methane in the transport sector by 2050. This includes the road transport sector, with an interim goal of 2% use by 2020, and the marine sector, which will see at least 20 vessels running on biomethane by 2020. The final report of the task force will be published in spring 2013. Endnote: Renewable methane means biomethane, wind methane, solar methane and other methane fuels produced by renewable energy sources. More information – NGV Global News item: Finnish Transport Sector Sets 40% Renewable Methane Target.